Entrust your advertisement to adverse professionals! All fuss and bother we take upon ourselves! 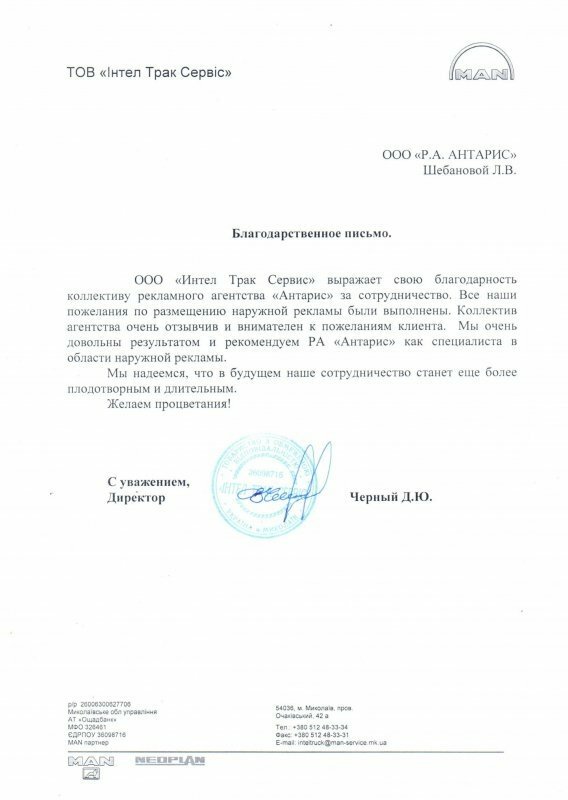 Іntel Truck Service, LLC Letter of Acknowledgement Intel Truck Service, LLC, expresses gratitude to the staff of Antaris Advertising Agency for cooperation. All our wishes regarding the placement of outdoor advertising were fulfilled. The staff is very responsive and attentive to the wishes of the client. We are very pleased with the result and recommend Antaris Advertising Agency as a specialist in the field of outdoor advertising. We hope that our future cooperation will become even more fruitful and lasting. We wish You prosperity! AKVAFEST, LLC Antaris Advertising Agency, LLC, is our partner in the field of marketing and outdoor advertising. During our cooperation, Antaris Advertising Agency, LLC, has proved its high professional status, competence and passion in solving assigned tasks. All work is done on time, in strictly stipulated terms and with adequate quality. Employees of the Agency competently cope with their duties. We are satisfied with the work of Antaris Advertising Agency, LLC, and are ready to recommend it as a reliable and responsible partner. 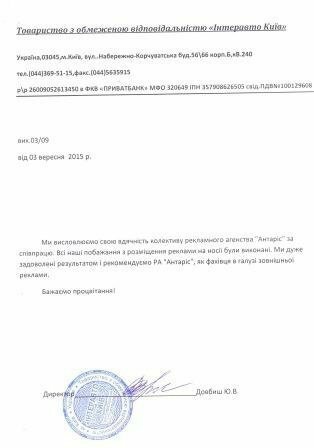 GEYSER, LLC Geyser, LLC, represented by Director Kovalenko Serhiy Vitaliiovych, expresses gratitude to Antaris Advertising Agency, LLC, for professional services in the field of advertising under the contract. We were pleasantly surprised by the timing of orders, quality of services and professional expertise of the staff. We hope for further productive cooperation! 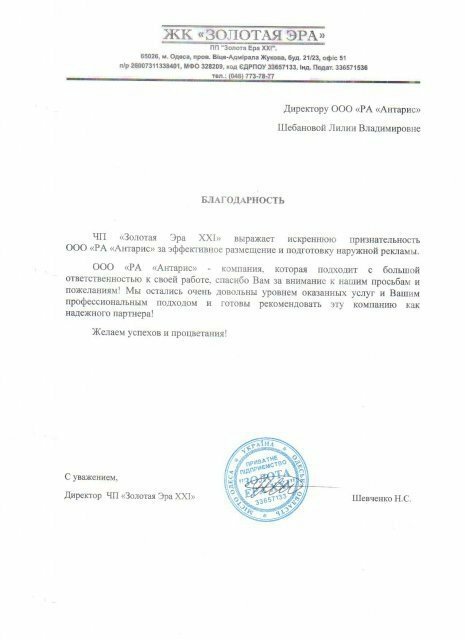 Director of Geyser, LLC Kovalenko I.V. 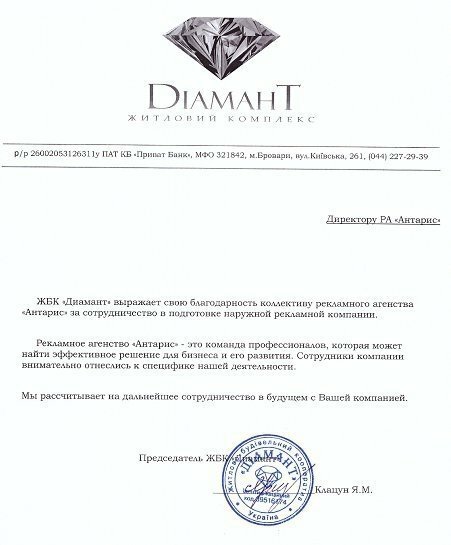 Housing Complex Diamond Housing Complex Diamond expresses gratitude to the staff of Antaris Advertising Agency for cooperation in the preparation of the outdoor advertising campaign. Antaris Advertising Agency is a team of professionals who can find the best solution for business and its development. Employees of the Agency carefully treated the specifics of our activities. We look forward to further cooperation with Your Agency. 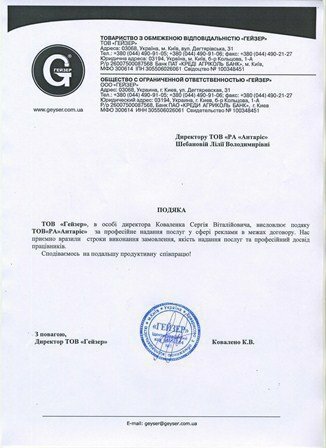 Private Company Zolotaya Era XXI Private Company Zolotaya Era XXI expresses sincere gratitude to Antaris Advertising Agency, LLC, for efficiency in placement and preparation of outdoor advertising. Antaris Advertising Agency, LLC, is a company that works with great responsibility. Thank You for Your attention to our requests and wishes! We are pleased with the level of services provided and Your professional approach and are ready to recommend this Agency as a reliable partner! We wish You success and prosperity! 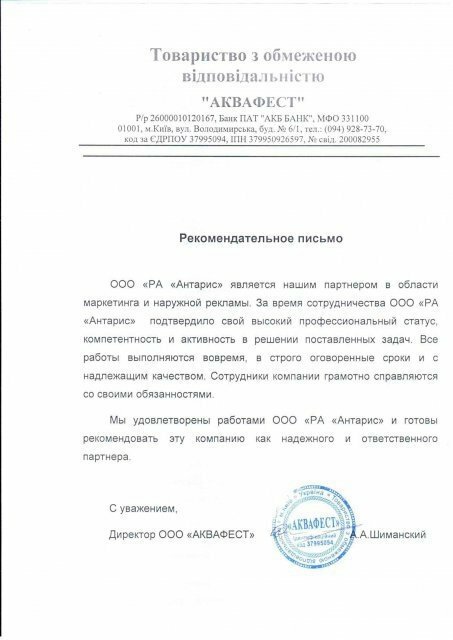 Interavto Kyiv, LLC We express our gratitude to the staff of Antaris Advertising Agency for cooperation. All our requests for advertising placement on the media were fulfilled. We are very pleased with the results and recommend Antaris Advertising Agency as a specialist in the field of outdoor advertising. We wish You prosperity! Welcome to the site of the outdoor advertising agency ANTARIS! The outdoor advertising agency ANTARIS is a Ukrainian company specializing in advertising activities using outdoor advertising. Thanks to the modern marketing tools and many years of experience in the market, our team is able to quickly carry out even the most powerful campaigns on outdoor advertising media in Kiev, in any region of Ukraine, in several areas at the same time, or – deployed – in all areas of the state. At the same time, we are not limited to renting advertising planes. Our experts organize for you a creative, effective advertising company from start to finish (with the choice of the best designs, with the development of the correct layouts of advertising appeals, with full documentary support and photo reports). Such a "set" of services will help your business to occupy and retain strategically important positions in selected niches with minimal investment and without time loss. Bigboards in Kiev – as well as in any other large city of Ukraine – are by no means the only popular carriers from the category of outdoor advertising. After all, in the modern media market, many tasks to communicate with the target audience can no longer be effectively addressed only by large and static designs. 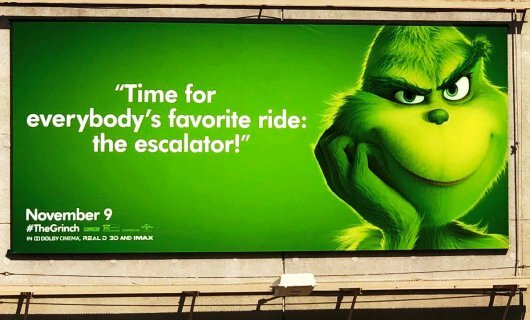 But with complex "orders" compact carriers and dynamic outdoor advertising can easily cope: scrolls, citylights, trolls, backlits, pillars, unipolis, pillons, holders, advertising on bridges, video boards or prisms. They can be installed in any crowded place, they are "conspicuous", they can provide an opportunity for advertising contact with the audience, even in very difficult conditions. Our agency has the most extensive database of such structures. Therefore, with us, any options are possible: traditional renting of bigboards in Kiev or Ukraine, placement of advertising on special media, and a mix of any kinds of designs you like. 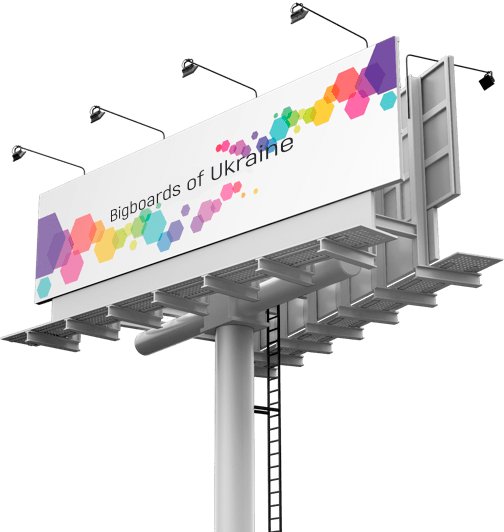 Our outdoor advertising agency in Kiev (as, indeed, throughout Ukraine) is a leader in the list of key players in the outdoor advertising market. But this fact is far from the only argument in favor of cooperation with our team. ANTARIS is a close-knit team of professionals in their field. And to become a client of our organization means to enlist the support of a competent and responsible partner. Thanks to many years of experience and well-coordinated work, we clearly and unmistakably organize and implement your advertising strategy. After all, experience allows us to take into account all the features and nuances of this complex sphere; it is experience that allows us to conduct advertising campaigns for our customers with maximum efficiency. 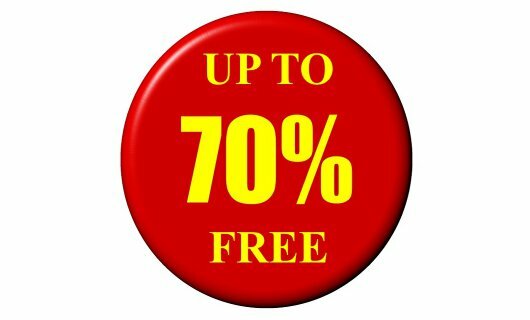 At the same time, our wide range of advertising constructions (only the bigboards of Ukraine are represented in our database by more than two tens of thousands of planes) will allow you to communicate with potential customers without budget dispersion, in a short time and with maximum compliance with your requirements for audience selection. 6. Honesty and efficiency! We guarantee our customers timely delivery of photo reports on our advertising campaigns, as well as control over the turnover of the necessary legal and accounting documentation. 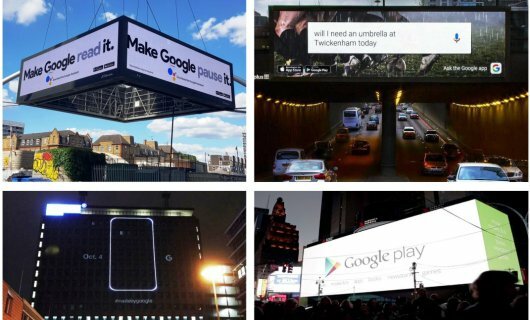 Get advice from our professionals on the choice of planes or on any other issue related to outdoor advertising. We promise: no matter what the size of your advertising budget, and no matter how important our advertising agency plays in solving your marketing problems, the prices for our services will be fair and competitive, and the service will meet the strictest European standards . Call or write to us, without delay: to work with us conveniently, efficiently and inexpensively. Integrated placement of outdoor advertising in Ukraine; Advertising on bigboards (all over Ukraine); Billboards in Kiev; Outdoor advertising in the Kiev region; Advertising agency (Kiev); Billboards in Kharkov; the price of advertising on bigboards; Billboards in Lviv (Lviv region); Outdoor advertising in Vinnitsa; Bigboards in Poltava; "Outside" in Sumy and Sumy region; Advertising on the boards of 3X6 in Ternopil; Rent of boards in the Cherkassy region; Bigboards in Chernigov and Chernihiv region; Borda in the city of Zaporozhye; Advertising on boards in Ivano-Frankivsk; Rent bigboards in Zhytomyr region; "Outside" in the Volyn region; Shields 3 x 6 in Mykolayiv; Advertisement on boards in Odessa and Odessa region; Rent of billboards in Rivne; The cost of advertising on boards in Uzhgorod (Zakarpattya region); Rent of boards in the Dnieper (Dnepropetrovsk); Borders in Kherson; Bigboards in Khmelnytsky region; Outdoor Advertising Agency; Outdoor advertising in Chernivtsi (Chernivtsi region); Prices for advertising on bigboards in Kropiwnicki; The price of outdoor advertising on intercity routes.